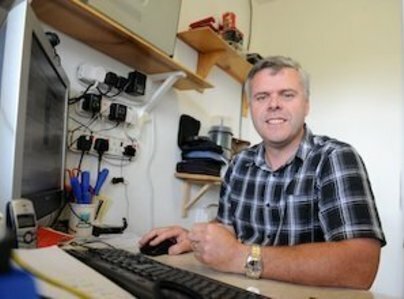 is a fast, efficient and friendly computer support service based in the Cardiff area. Established in 2004. AD Computers visit you and solve 99% of all PC problems at home or office. First of all Andrew was recommended to me via an IT professional working in other areas of technology and I could not have been more happy with his service. I needed to have data wiped from my ancient PC so I could dispose of it but wanted the data stored so I can access it. Andrew explained precisely what this entailed in layman's terms and now my spare room is de-cluttered along with my mind! Thank you Andrew. Andrew had a great personality and solved my Outlook problem and then a few more issues that had been bothering me for a few months that I had put up with. He was happy to explain why the problem had happened and he gives the guarantee if it goes wrong soon afterwards or it causes another problem he will fix that at no cost. It's great to know there is someone reliable for me to use of I have another problem. Would recommend him unreservedly. I have sought Andrew's advice and help a number of times now regarding my home computer needs. His knowledge and expertise surprise me every time, and I know he is also a man of integrity. Highly recommended. I have used Andrew for many years now, he is a very reliable thoroughly professional person who is able to understand computing needs of ordinary people. He provided an excellent service when he replaced my old computer. I am sure I saved a lot of money by going to him and not the "big boys". Andrew has been a wonderful computer problem solver for us. He is very easy to talk to and knows exactly what the problem is and visits as soon as he can to help. I used to have a Windows Pc but didn’t want to replace it when it needed to be replaced. Instead I bought a MacBook which was completely different and he transferred everything from the computer onto the MacBook but left the old hard drive with me in case I needed it later. He is our first port of call to do with any problems with our MacBook or televisions as he is able to figure out an answer to everything to do with technology. I contacted Andrew to upgrade my computer with a solid state drive. He talked me through the process and completed the job incredibly quickly. During the process, he kept me informed and provided sound advice on which I was able to make a decision. Professional, thorough and knowledgeable. I first consulted Andrew to sort out a security problem that I had with both my desktop and laptop, which he fixed rapidly, and at a very reasonable price. Whilst chatting I mentioned that I thought the desktop would need replacing before long, as it was struggling a bit and slow, given that it was running a 32-bit operating system on 4MB RAM. But Andrew mentioned to me the option of upgrading my desktop as the processor was pretty fast, which hadn't occurred to me as an option. So he did this recently, fitting a solid state drive in addition to my present hard drive, uprating the system to 64-bit and doubling the RAM. All done in a couple of days, leaving the computer with him to do the work. All I was left to do was reinstall the software which was quite straight-forward. Now my computer is as fast as a brand new one, at a fraction of the cost! Great. Certainly recommended. 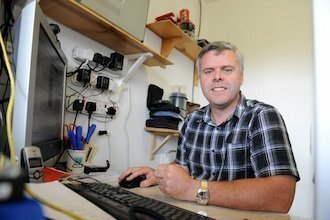 Andrew has been our computer 'guru' for many years, installing devices and tailoring them to our specifications. He troubleshoots for us by phone, email, or a visit when necessary. We find him knowledgeable and efficient. The perfect person when something goes wrong with your computer. Will visit the house to discuss and assess the problem, take and repair the computer and quickly return and re-establish the installations, spending time to explain what has been done and how to quickly be once more up and running. He was recommended to me, his charge is quite reasonable and I would certainly recommend him to others. He is friendly, competent and a pleasure to work with. I have been without my computer for several days - the snow delayed things and then a spare part caused a day's delay so it was great to see Andrew this morning. He replaced the broken RAM, helped me sort out a few problems and now I am back to normal and very grateful for a very professional job done.